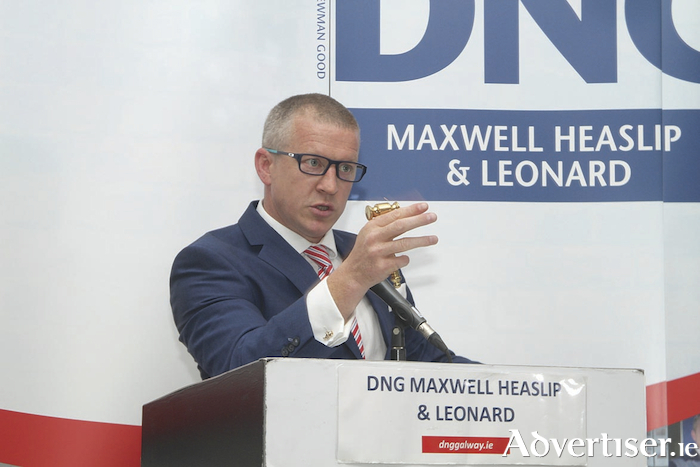 With the assistance of their DNG Nationwide colleagues spread throughout the west of Ireland, James Heaslip says that access to local agents is a key factor. “We are really lucky to have highly qualified agents all along the west coast. When a buyer attends one of our viewings, they do so knowing that they will meet an agent who has years of experience and in-depth knowledge of their local markets. Also, having agents who are based close to the properties, it allows us to offer different viewing options which often take the pressure of those who can’t make the set open viewing times. A spacious four bedroom townhouse comprising 110sq m in the much sought after Dun Aengus development. Overlooking a private courtyard, this well located property has four floors of living space, with four bedrooms, three bathrooms, and an open plan kitchen/living/dining room. An ideal opportunity to acquire a top class investment property in a wonderful residential enclave. Just a short walk from Galway city centre and all its amenities. A most impressive three bedroom apartment located in the much sought after residential area of Upper Newcastle, within walking distance of NUIG and adjacent to the stunning River Corrib and Dangan. Comprising 80sq m of living space and presented in pristine condition, this tastefully decorated property is part of a block of just three apartments with its own private entrance, off-street parking and communal rear garden. This gem will most certainly appeal to both owner occupiers or investors given its prime location. An extremely spacious three bedroom semidetached property in the very popular Danesfort Court. Comprising approximately 120sq m of living space, the property is located within walking distance of Loughrea town and all amenities, with nearby access to the M6 motorway providing ease of access to Galway city and all commuter towns. Overlooking a green area with ample parking, this property would make an ideal family home or indeed an astute investment property. A derelict detached bungalow residence with outbuildings in the rural townland of Newtowndaly, Loughrea, Co Galway. Comprising approximately 100sq m of living space on a site of c2.9 acres and in need of renovation, this is an ideal development project, subject to planning. A spacious three bedroom semidetached property in the very popular Danesfort Court. This house has approximately 120sq m of living space and is located within walking distance of Loughrea town and all amenities, with nearby access to the M6 motorway providing ease of access to Galway city and all commuter towns. Overlooking a green area with ample parking, this property would make an ideal family home or investment property. A detached three bedroom bungalow residence comprising 120sq m of living space. The property is located in a sought after rural location close to both Monivea village and Athenry town. Within 25 minutes of Galway city and close to the M6 Galway-Dublin motorway. An ideal opportunity for those seeking a starter home. A three bed end terraced property comprising approximately 120sq m of living space, located on the Lahinch Road, just 2.5km from Ennis town centre. The subject property overlooks a large green area and would be an ideal opportunity for a first-time buyer or investor. Viewing is highly recommended. A three bed semidetached residence within walking distance of all local amenities and main industrial parks. The property comprises approximately 98sq m of living space and is presented in good condition with some minor refurbishment required. Viewing is highly recommended. A lovely four bedroom semidetached property comprising approximately 110sq m of living space. The property overlooks a large green area and enjoys spacious accommodation over two levels. Presented in excellent condition throughout the property would make a fantastic family home. A superb three bedroom semidetached property located in Ballymote. Comprising c76sq m of living space, this property would make an ideal family home or investment property. While in need of some updating, this property allows for excellent potential. A detached two bedroom single storey cottage sitting on a generous site of circa 0.7 acre and comprising approximately 55sq m of living space. Located in south Sligo, just 4km from Charlestown, this property benefits from all this village has to offer. Amenities close by include primary and secondary schools, shops, restaurants, pubs, banks, and churches. A spacious four bedroom semidetached property located in the border town of Bridgend approximately 11km from Derry, comprising c115sq m of spacious living accommodation and presented in excellent condition. Includes a large back garden. Viewing is highly recommended. A spacious four bedroom end terrace two storey property comprising 105sq m of spacious living accommodation. Features include PVC double glazing, oil fired central heating, and a large back garden. Ideal opportunity for a first time buyer or investor.